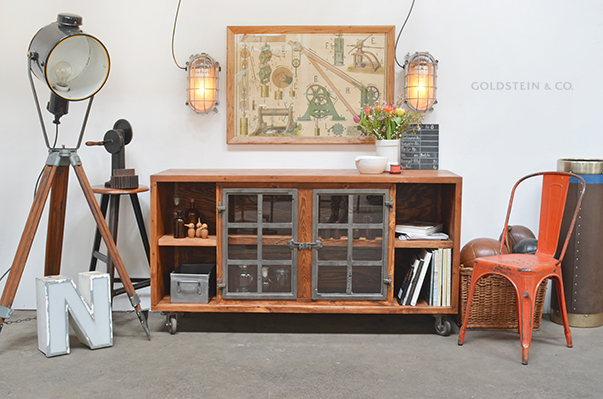 This is one of our bestsellers, making it sometimes difficult to keep in stock. It was affectionately referred to by East German workers as the ‘turtle’. 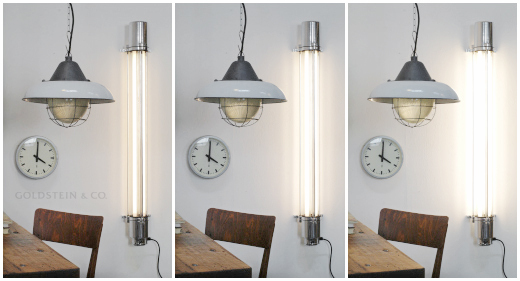 Lamps of this type were produced in East Germany until well into the 1970s. This universal design was employed in almost all industrial sectors and the military. 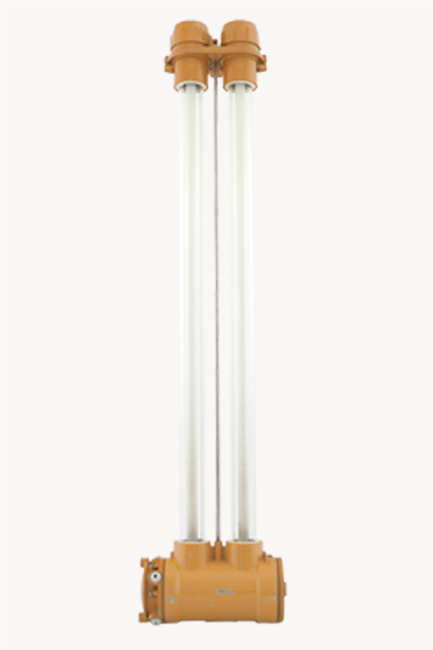 It comprises a solid ceramic E27 socket spring-mounted on a die-cast aluminium body. A larger or smaller version is also available. Please don't hesitate to contact us! 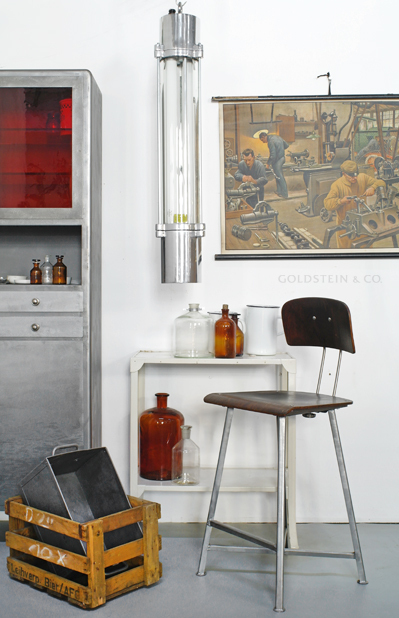 These industrial lights are our passion! Made in East Germany between the 1960s and 1980s (during which time they underwent only minor design alterations), they were built with the toughest conditions in mind. Dustproof, splash-proof and gas-proof, they were hence used throughout the chemical industry, in potash mining and at power stations. The aluminium has been polished and the electrics replaced. 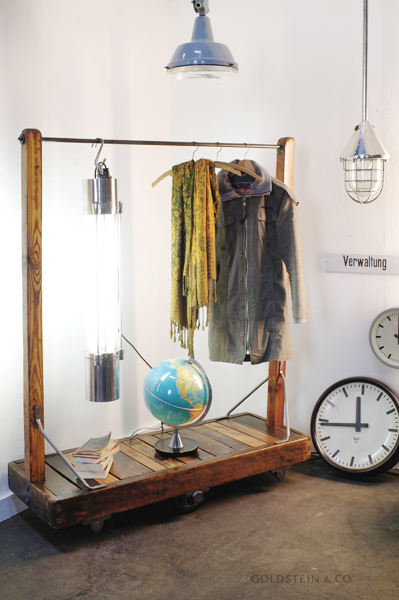 You can order these lamps also in a dimmable version. Please feel free to contact us! 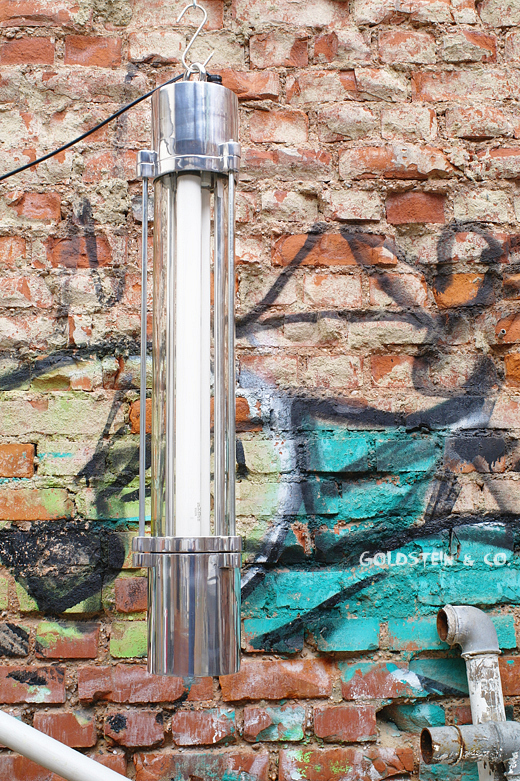 This waterproof light is made out of aluminium, steel and glass. 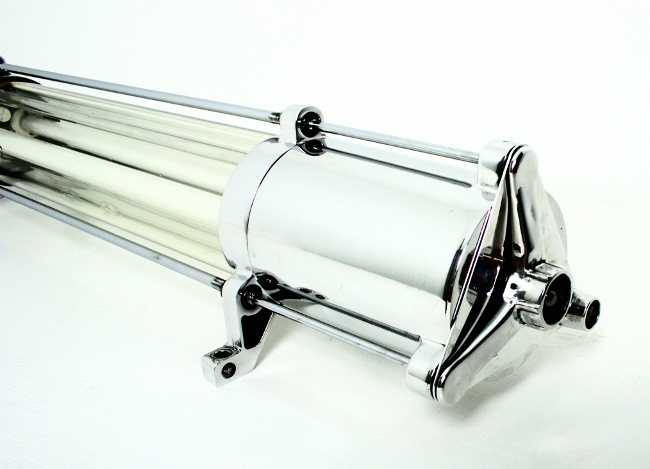 Designed for use in the food industry, laboratories and hospitals etc, only small batches were produced in the 1950s and 1960s. 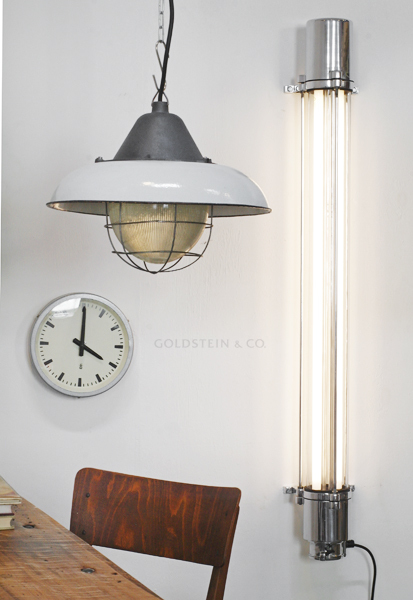 We have managed to salvage a small quantity of these stunning, extremely rare light fittings. The aluminium has been polished and the electrics replaced. These lights are our passion! Made in East Germany between the 1960s and 1980s (during which time they underwent only minor design alterations), they were built with the toughest conditions in mind. Dustproof, splash-proof and gas-proof, they were hence used throughout the chemical industry, in potash mining and at power stations. These lights are distinguished by their simple, straightforward design, which gives them the appearance of floating when fitted on a wall or ceiling. Amazing lighting effects can be created by using different colour gels. 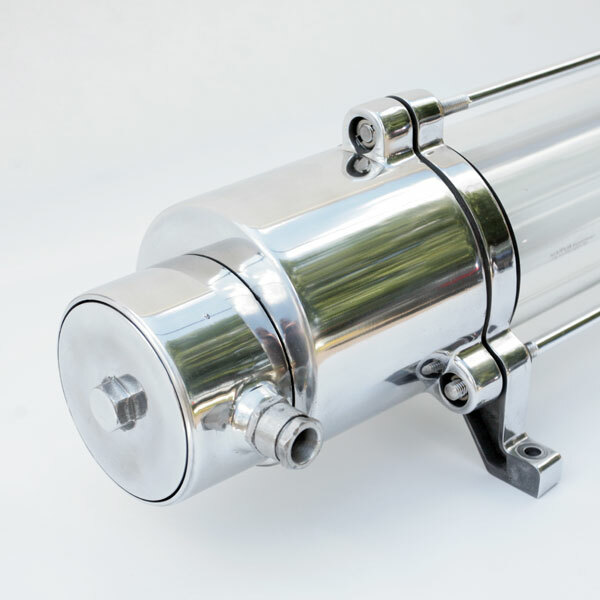 Both end pieces are made of aluminium and are connected together using three aluminium rods. This particular design is the lightest version featuring thin glass and four-point mounting and is suitable for living areas. 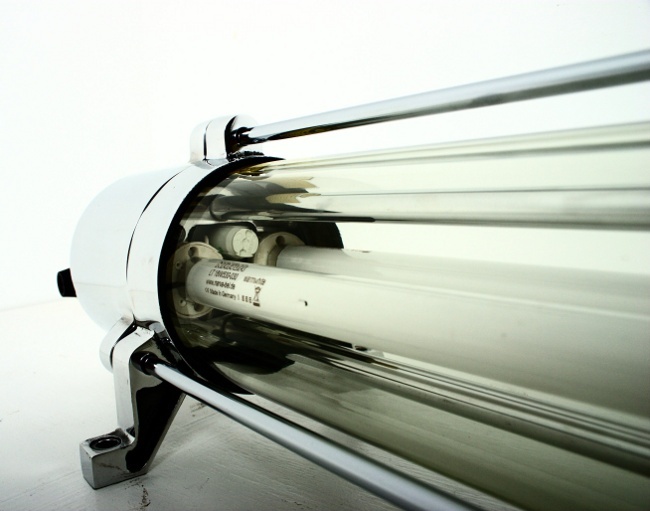 Replacing the fluorescent tube is easy – just three nuts have to be removed in order to take out the internal lamp body. 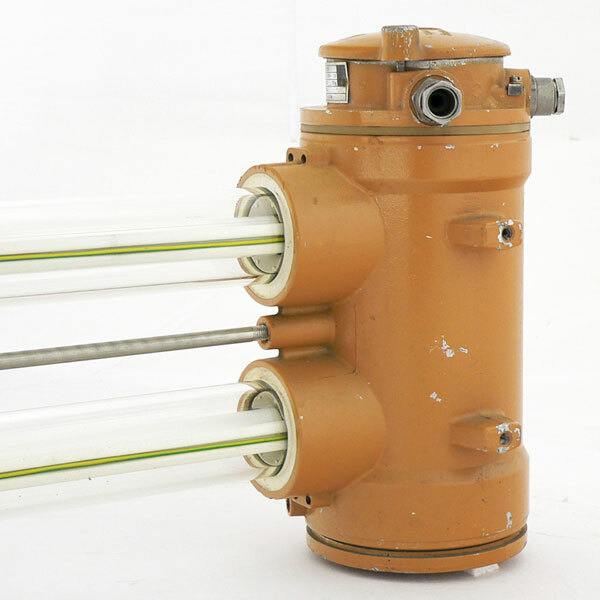 Prior to delivery, the lamp is completely dismantled, the aluminium parts are polished, and the electrics are improved using modern components. 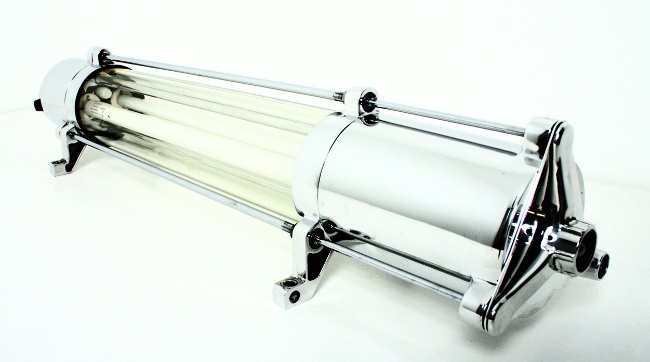 The largest type of 'Bunker lamp" we have in stock. 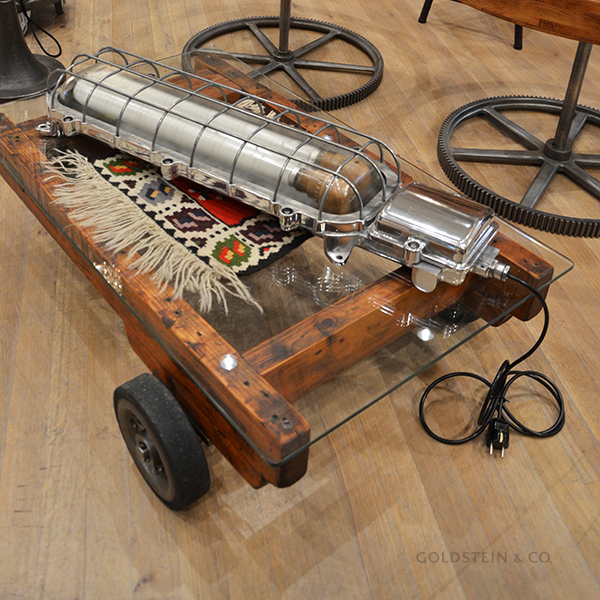 It was affectionately referred to by East German workers as the ‘turtle’. 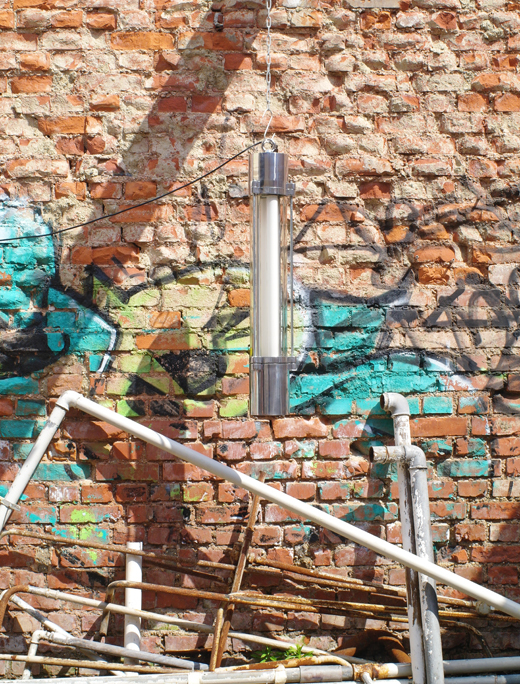 Lamps of this type were produced in East Germany until well into the 1970s and this universal design was employed in almost all industrial sectors. 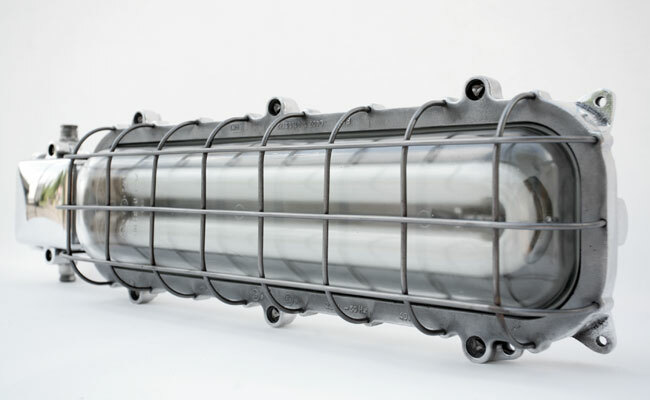 It comprises a U-shaped fluorescent tube on a die-cast aluminium body. Thick protective glass fitted with a rubber profile is fixed to the body. In this version, the two sections are held firmly together by the screwed-on steel cage. Body, box and cage have been re-polished. 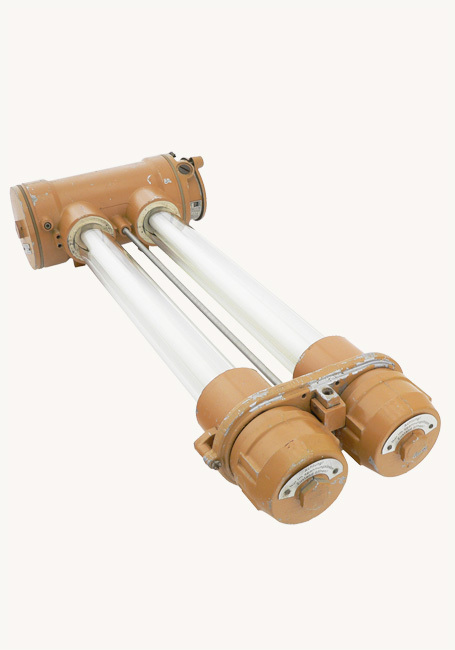 The fixture takes a standard fluorescent tube. 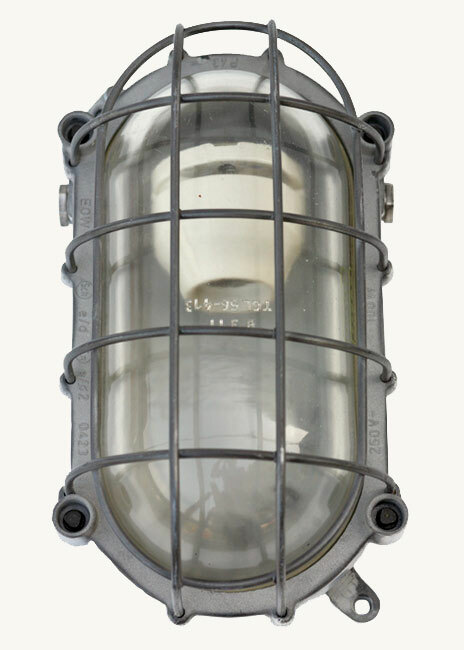 This is a highly expressive light fixture. 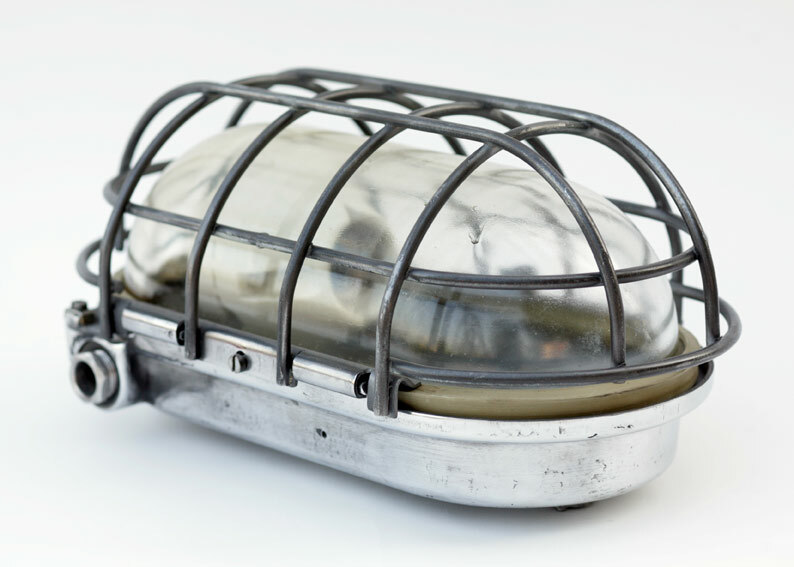 Owing to its elaborate design and intensive use of materials, this explosion-proof, splash-proof light was only ever produced in small quantities. It was mainly used by the East German railways. 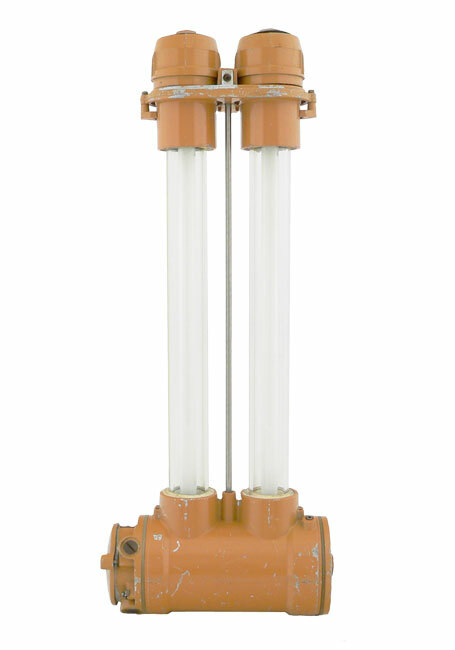 The metal cylinder consists of solid die-cast aluminium and contains the fluorescent lamp ballast. 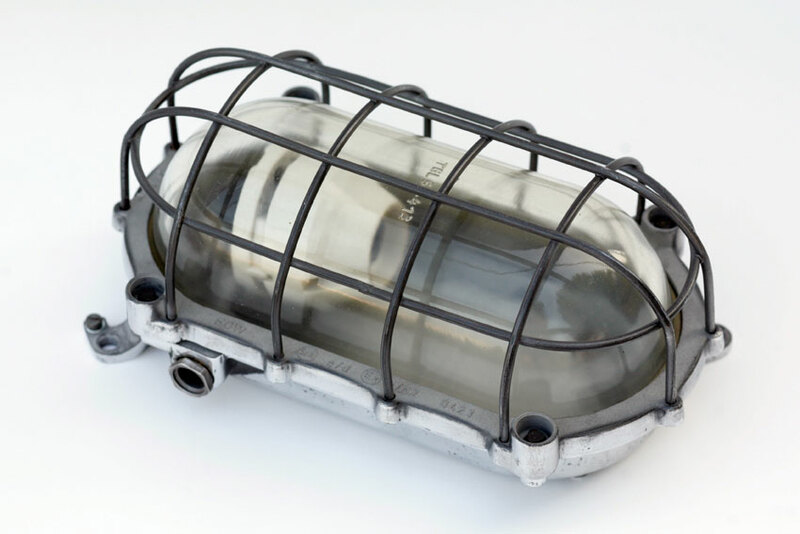 The parallel, thick-walled tubes made out of safety glass provide the connection with the aluminium cover plates. 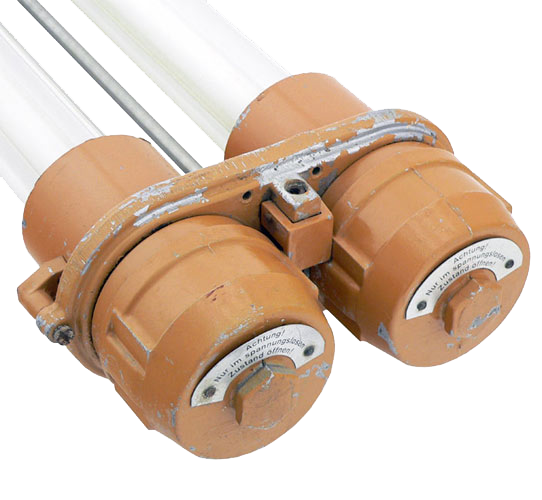 The two easily replaceable standard fluorescent tubes ensure bright illumination. 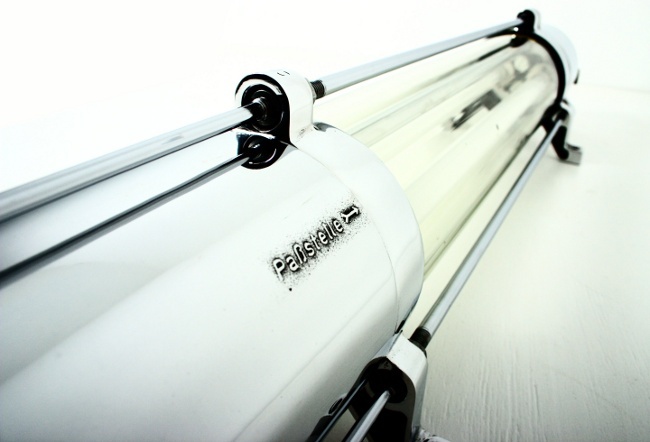 If required, unusual lighting effects can be achieved by using coloured fluorescent tubes. 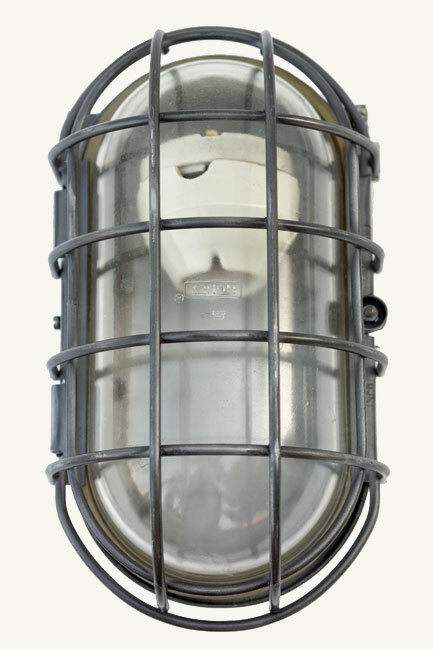 These lights are also suitable for outdoor use. Note that their beautiful original orange paintwork shows traces of wear. 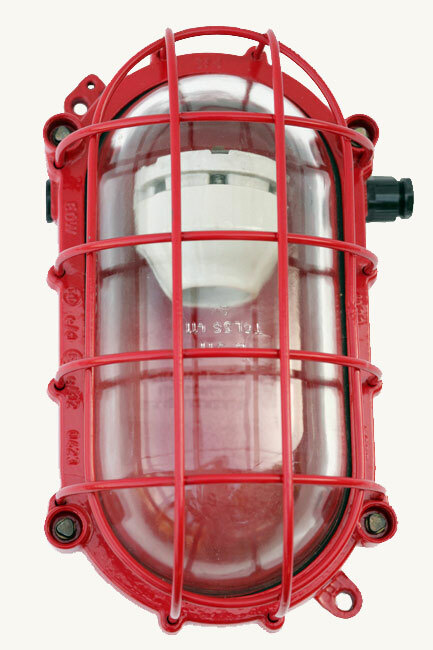 All lights are professionally cleaned before dispatch. 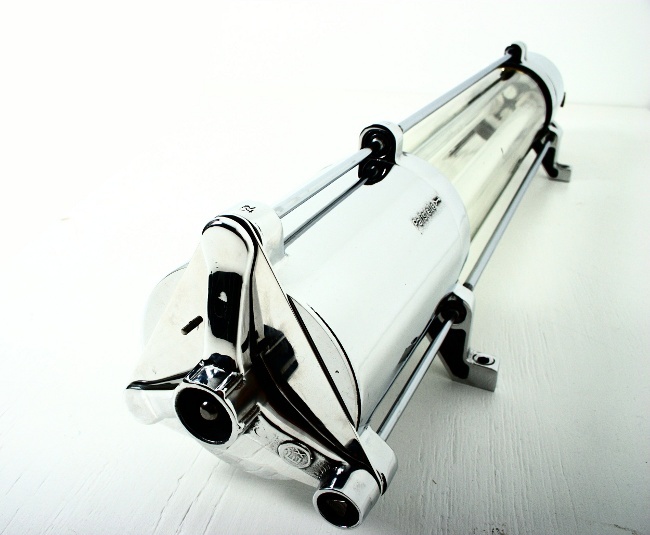 Dimensions:90 x 34 x 18 cm | 35.5" x 13.4" x 7"
This is one of our bestsellers, making it sometimes difficult to keep in stock. It was affectionately referred to by East German workers as the ‘turtle’. 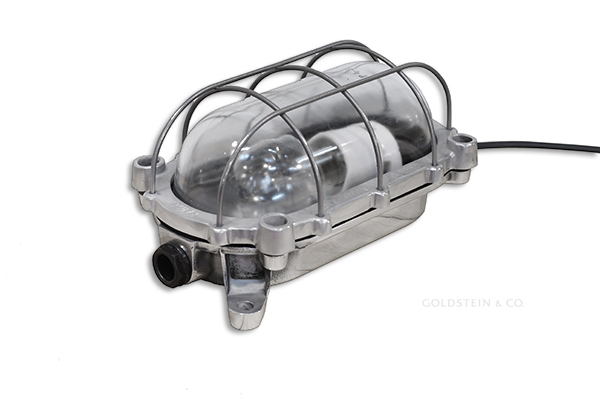 Lamps of this type were produced in East Germany until well into the 1970s. This universal design was employed in almost all industrial sectors and the military. 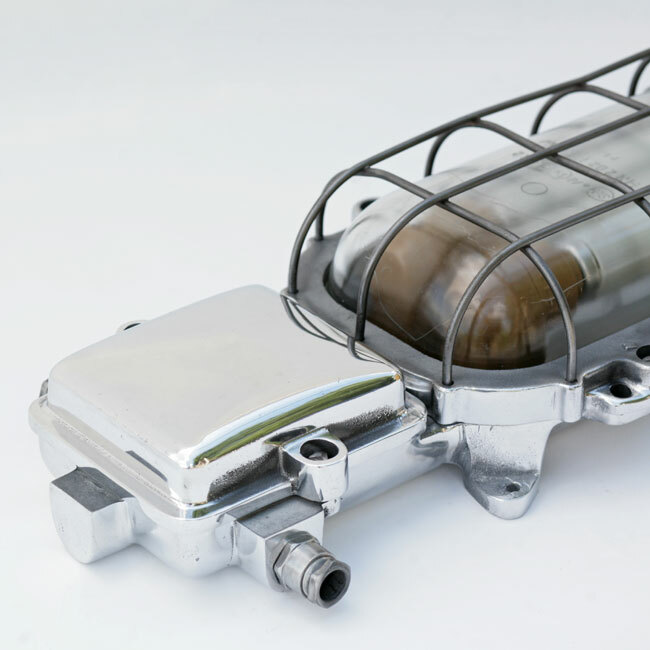 It comprises a solid ceramic E27 socket spring-mounted on a die-cast aluminium body. Thick protective glass fitted with a rubber profile is fixed to the body. 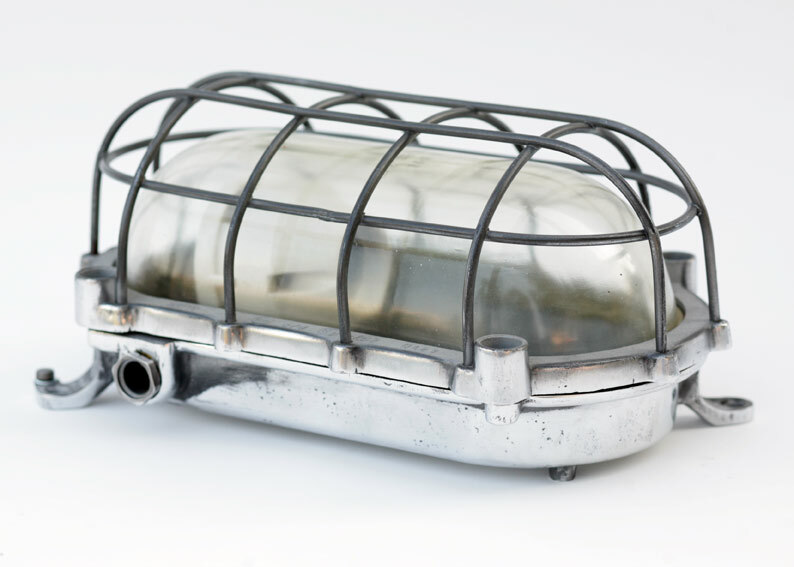 In this version, the two sections are held firmly together by the steel click-cage. Body and cage have been polished. A smaller version is also available. This is one of our bestsellers, making it sometimes difficult to keep in stock. It was affectionately referred to by East German workers as the ‘turtle’. 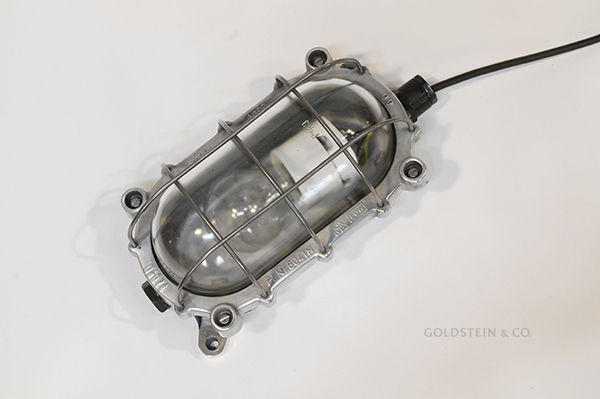 Lamps of this type were produced in East Germany until well into the 1970s. This universal design was employed in almost all industrial sectors and the military. 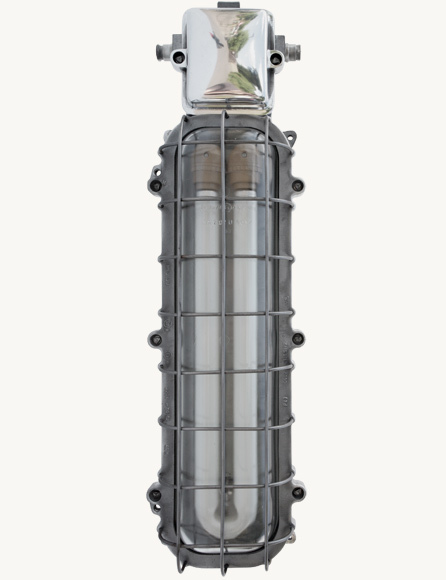 It comprises a solid ceramic E27 socket spring-mounted on a die-cast aluminium body. Thick protective glass fitted with a rubber profile is fixed to the body. In this version, the two sections are held firmly together by the screwed-on steel cage. 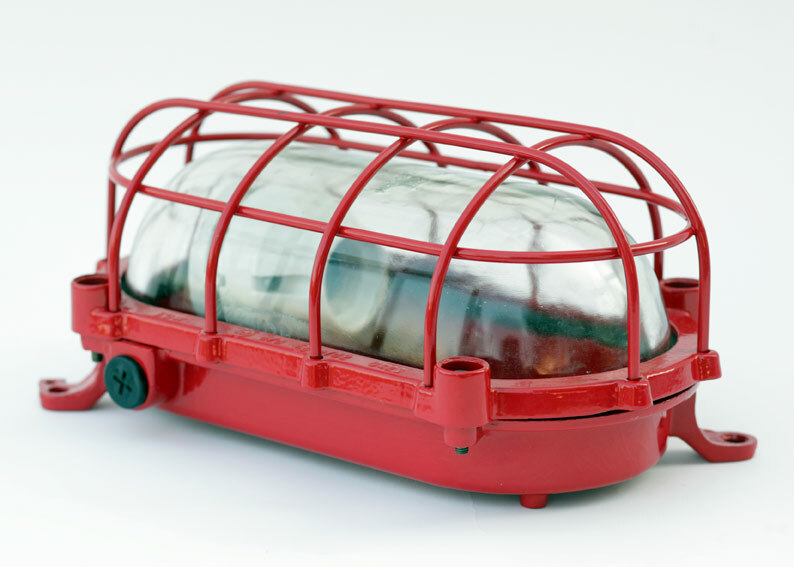 Body and cage have been red powder coated. A smaller version is also available. This is one of our bestsellers, making it sometimes difficult to keep in stock. It was affectionately referred to by East German workers as the ‘turtle’. 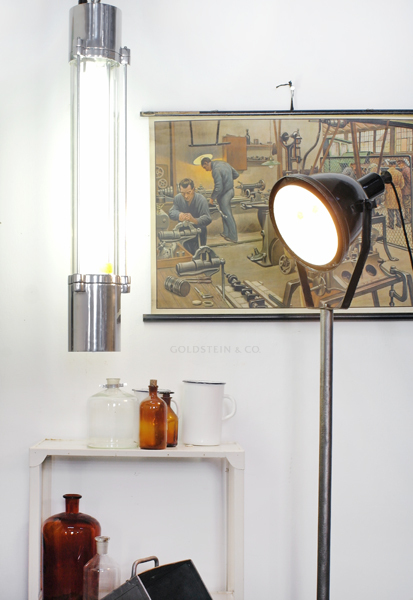 Lamps of this type were produced in East Germany until well into the 1970s. This universal design was employed in almost all industrial sectors and the military. 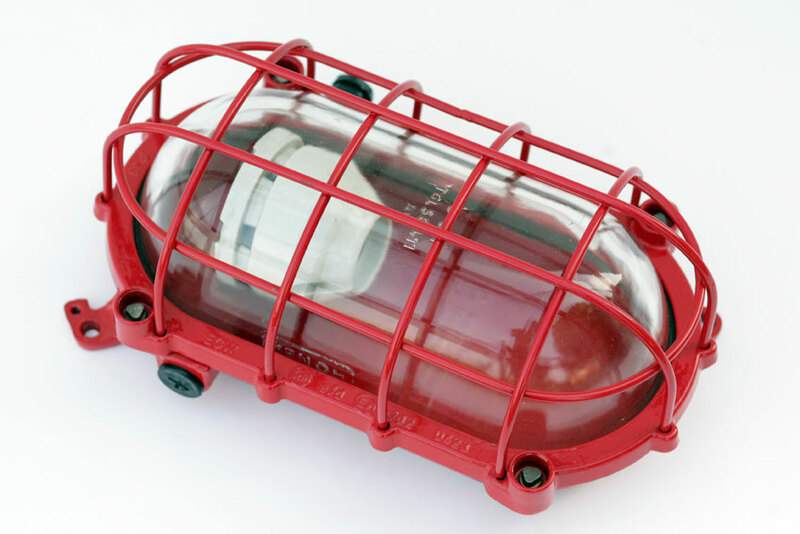 It comprises a solid ceramic E27 socket spring-mounted on a die-cast aluminium body. Thick protective glass fitted with a rubber profile is fixed to the body. In this version, the two sections are held firmly together by the screwed-on steel cage. 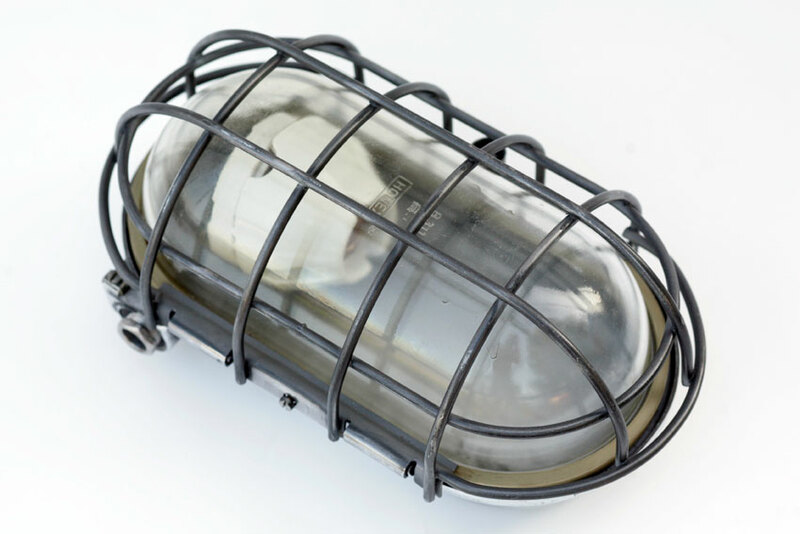 Body and cage have been re-polished. A smaller version is also available.